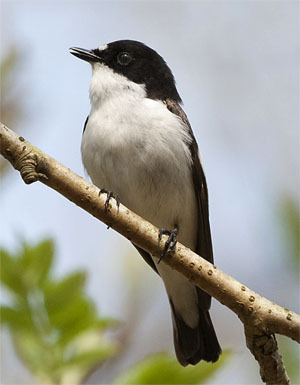 Somewhere in Finland, nested in a lich-coated oak, a Pied Flycatcher wants to raise a family. But laying eggs is risky business. The investment of energy is large, and a tiny miscalculation in timing may mean the difference between success and devastating failure. Food supply, climate, predators, competition -- all must play a role in her decision. The question was answered using a simple and ingenious experiment you could try in your own back yard. Jukka T. Forsma and his partners at Oulu University in Finland considered cues in the environment that might prompt her to pick the best time for laying a clutch of eggs. One hypothesis is that this social bird might be using the clever strategy of watching her neighbors. Waiting until you see others laying eggs improves your chances of surviving predators, and offers the reassurance that others have also decided the time is right. To test this hypotheses, Forsma put dummy nests filled with eggs in locations where the birds would notice them. Counting the resulting Flycatcher eggs confirmed their guess -- the flycatchers laid bigger and more numerous eggs when they were convinced that others were doing the same, showing that this small bird has remarkable control over the investment in egg production -- and is clever enough to use indirect evidence before making her choice. But the discovery may not be as new as it seems. Since the dawn of civilization, savvy human farmers have known that slipping a few wooden chicken eggs into nests will encourage hens to lay.